Wet fry pork recipe: Pork is a type of white meat enjoyed among Kenyans both in hotels and homes. Place the chopped pork in a Sufuria or saucepan and place on medium heat. Add a teaspoonful of cooking oil and fry the meat until it turns golden brown. This is to get rid of any unpleasant taste brought by pork fat. Drain the excess oil into a container leaving only a half teaspoonful. Add the chopped onions and stir for 2 more minutes and then add in garlic and continue mixing for another 2 minutes. Add the chopped tomatoes and stir in between until all the onions are crushed forming a thick sauce. Sprinkle some salt and Royco cubes and if you like chilies, this is the time to add some. Add a half Cupful of water and reduce heat. Let it simmer for about 5 minutes or until the meat is tender enough according to your liking. Turn off the heat and add coriander and mix. Cover for two minutes then serve while hot. Pork can be served as an accompaniment for Ugali, rice and smashed potatoes. Enjoy! 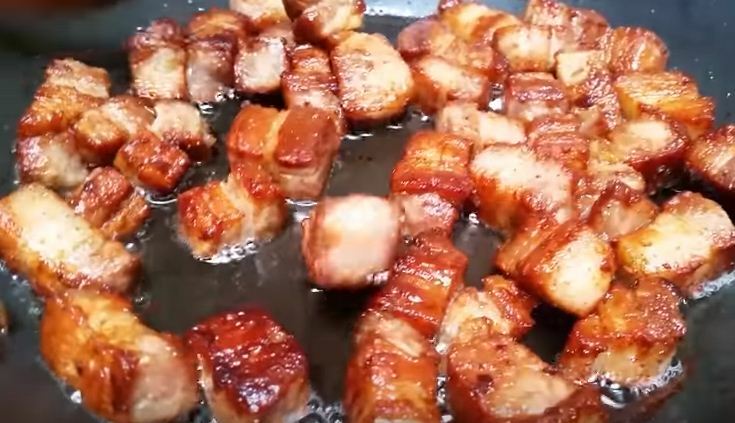 Do not miss all our latest updates on how to cook fry pork.